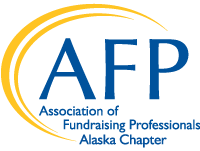 The AFP Alaska Chapter is committed to making membership and program offerings available to everyone who has an interest in professional development. Each year, we are able to offer several scholarships for membership fees and educational workshops, conferences, and events. We encourage you to explore these opportunities and to share them with others who may be interested in becoming a member or renewing their membership! The Alaska Chapter is committed to investing in new and current members' continued professional development through AFP membership. Membership scholarships are available by application to any nonprofit professional who is interested in joining AFP or renewing an active membership . Membership scholarships are awarded throughout the year until funds are expended. Young Professional: Open to persons who hold some degree of responsibility directly for fundraising, work within the U.S. and Canada and are compensated for their services, and are 30 years old or younger. Applicants can apply for the AFP Alaska Chapter to cover their complete membership costs. Applicants must be employed as full-time fundraising professionals or spend at least 50% of work time fundraising. Recipients are required to participate on a committee for the AFP Alaska Chapter. Strong consideration for demonstrated financial need, active chapter involvement, and for those applicants that demonstrate diversity within the chapter. Full membership in the Association shall be open to individuals (a) who, among other responsibilities, hold some degree of accountability for income-generation within the fundraising process; (b) who must hold some degree of responsibility directly for fundraising; (c) who are compensated for their services; and (d) who subscribe to the AFP Code of Ethical Standards and promote the Donor Bill of Rights. Active members in good standing may vote, serve on chapter or Association committees and task forces and hold Association or chapter office. Associate membership in the Association shall be open to individuals or volunteers (a) who are engaged in fields related to fundraising and fundraising support, or (b) who have mutual interests with fundraising professionals, and (c) who subscribe to the AFP Code of Ethical Standards and promote the Donor Bill of Rights. Associate members in good standing may vote, serve on chapter or Association committees and task forces and hold Association or chapter office. The AFP Alaska Chapter Professional Development Scholarship is awarded to applicants for up to $500. This scholarship is for sanctioned AFP International education programs or professional certifications including, but not limited to: CFRE Review Course, CFRE or ACFRE Certification or Recertification, and Fundamentals of Fundraising (First Course). The scholarship will be given as reimbursement for expenses for course(s) and/or certification related fees only and cannot be used for travel or accommodations. Professional Development Scholarships are available to current AFP members only. The Alaska Philanthropy Day Scholarships are awarded to AFP members to cover their event registration fee. The scholarship recipients are responsible for any additional costs incurred to attend the Alaska Philanthropy Day conference, including travel and lodging. Scholarship recipients are required to participate at the Alaska Philanthropy Day conference as luncheon volunteers. This is a reimbursement scholarship and recipients will be reimbursed after submission of event registration fee. Strong consideration will be given to those applicants who have not attended this event previously. Alaska Philanthropy Day scholarships are available to AFP members only. The AFP Chamberlain Scholarship is awarded to one person from each AFP local chapter, and provides a total of up to $1,785 for registration and other expenses associated with attending the AFP International Conference on Fundraising for the first time. AFP International provides up to $785 for registration and the Alaska Chapter provides up to $1,000 to be used toward travel, hotel and expenses. The scholarship recipient and/or their employer/organization is responsible for any costs incurred over the amount of the scholarship. (The total cost is typically around $2,500 depending on location). Applications must be able to attend the annual conference and must fulfill all obligations associated with being a Chamberlain Scholarship awardee. Awardees must also write a brief newsletter article about their experience upon their return. Recipients are required to participate on a committee for the Alaska Chapter of AFP.